How on earth do you plan a motorhome road trip to Europe? I mean seriously, where do you even start with that? There are so many options, so many countries, so many languages and so many RULES! It can be completely overwhelming, especially if you only have 2 weeks to tour around Europe and need to squeeze it all into a school holiday. But it's completely doable. I promise. Travelling around Europe in a motorhome is one of my absolutely favourite things, and so far ALL of our European adventures have happened in one/ two-week windows. So, grab a glass of something cold, put a movie on for the kids/ pets/ significant other and let's figure this thing out together! For the majority of this article, I'm going to assume you're taking your motorhome to Europe during School holidays/ a two-week break and that you live in the UK. If either of those things doesn't apply to you, don't worry- there's still plenty here to help you. Planning a Motorhome Road Trip to Europe- where to start? HOW do you want your Motorhome holiday in Europe to be? Touring Europe in a Motorhome- the weather! Believe it or not, I get asked this question a LOT. You are not alone in your overwhelm. Just the basic question of WHERE to go can be too complicated for many, especially if they've never taken a motorhome to Europe before. Are you happy to go to a foreign country? Driving on the wrong side, speaking a foreign language, eating foreign foods? Not everyone is, and that's ok. Better to figure that out now, rather than later! How long do you want to drive for? Do you want to see/ do something specific? Once you've answered those questions, you should have a rough idea on the radius of the area you can reach in your time frame- assuming you have a timeframe of course! For example, we are going away to Europe in our motorhome in April. We have two weeks (Easter School Holidays) and we are happy to drive on motorways/ toll roads and then take back roads to explore the area once we arrive. We want to see castles, ruins and some waterfalls. And we most definitely want to go to a foreign country. With these parameters, most of Western Europe is open to us. One other criteria (criterion??) we have is we want to go somewhere we haven't been to before (the map on the back of the van needs filling in!) 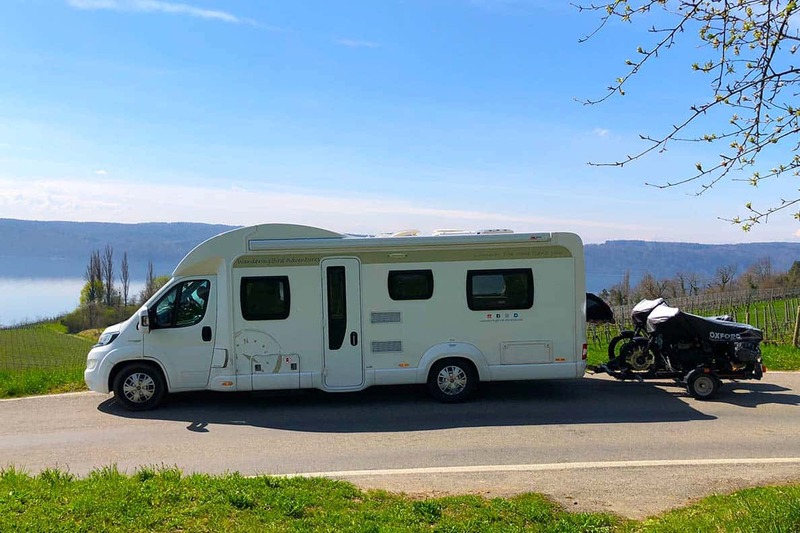 So we assessed our options, had a good look on Instagram and decided to take out Motorhome to Germany, with specific focus on the Black Forest and Bavaria in Southern Germany. It could easily have been Holland, Southern France, Austria, Northern Germany, Belgium or Denmark… all of those fit within our parameters (except France, as we've been there before). So we did a bit of Googling and in the end, we (I) just picked one! Ok, so you've picked a rough area or country. Awesome! Let's narrow it down just a little for you. As soon as we've decided on an area, we start researching specific things to do/ see once we're there. Literally, I Google “Best things to do in_______ (in our case Southern Germany)” Invariably 100 million results will be returned, but everything you need will normally be on the first page of Google. Something like a Tripadvisor ‘Best of' Board or a Tourist Information website is perfect to get you started. The other place to look is Pinterest. Seriously, it's BRILLIANT for finding itineraries, ideas and cool places to see. We're taking our motorhome to Germany to explore, but we're also going to help our daughter out with her college homework, so she needs to take photos of old buildings, castles and ruins. So that has heavily influenced our potential destinations. For you, it might simply be as easy as “I've never been there before” or “I like the wine/ food/ weather and I want to go back.” There doesn't need to be a serious and impressive reason to go anywhere. After all, it (hopefully!) isn't going to be your last holiday- there'll be many more to enjoy! If you are going in the heart of August, it will be useful for you to decide at this stage how you want your motorhome holiday to go. Do you want to stay at a campsite which has loads of activities for the kids to do, or a beach/ playground/ kids club? Do you want to wild camp in your motorhome and stay at a new place each night? Do you want to use aires/ free overnight parking spots in Europe and stay 2/3 nights in a place? The reason this is important to decide this early is the motorhome campsites in Europe get busy! They can get booked up VERY early- especially the ones with a beach/ pool/ kids club/ surf school. If you want to stay on one of these for a week/ two-week European break, you need to pick your dates, pick your place and book it asap. Then figure out how long it will take you to drive your motorhome to the campsite from the ferry/ channel tunnel, and book that up too. That's you (nearly!) done. Lucky you- and that is one of the reasons campsites are SO popular- they're easy, everything is laid on for you and it doesn't take much planning as long as it's done well in advance. However, if you don't have kids or want to do something away from a campsite and move locations regularly, things can still be looking a bit more complicated. Hopefully, your Google search will have created a list of places you want to visit. I like to plot these into a Google Map- just like the one you can see in the sidebar of this page or on our Home Page. I add all the Places of Interest in as I find them, and then I start to see a rough route and itinerary developing. I like Google Maps because it's easy and it keeps all my ideas organised so I can find them again, but you can just as easily use a paper map, a printout or even a list on the back of an envelope! Whatever works for you. If you click on our link to Google maps, you can see that the blue pins are the places we would like to visit on this tour (UPDATE- the dark blue pins are places we visited). You can also see how far away Berlin is from the rest of the points. We've left it on there and if we magically find some time we would love to go, but we're not banking on it as it's SO FAR away. That is why the map is so useful- it shows you exactly where the places are and lets you make an informed decision on how best to see them. It also gives us a rough route, although we don't plan our routes in advance. If you do want to head to Cornwall, (which I highly recommend!) here's an incredible Cornwall Road Trip itinerary! If you live in America or Europe, there's a high chance you can skip this section (although skim it just in case you learn something useful.) But if you're in the UK or on some other island, you need to find a way off it! If you don't want to drive from Plymouth to Dover and then back to Brittany, the ferry is the only option. Costs are fairly similar for both if you book in advance, although ferries tend to be much cheaper in the winter- for obvious reasons! You've decided on where, when, for how long and how you're going to get there. The next thing we look at is the weather. For example, it would be pointless doing the trip we want to do in Germany in the middle of winter when they experience high snowfall- apparently many places aren't very accessible when it gets really bad, especially to a motorhome in the mountains! We actually thought April would be warmish and good biking weather, but looking at it I think it's going to be 10-12 degrees and chilly! Our bad. It's currently undecided if we'll even take the motorbikes yet as it's pointless dragging them around everywhere if we're not going to ride them! So make sure you check the weather a week or so before you go and bring appropriate clothing. I always recommend taking something warm even if you're going on a sunny holiday- or when you end up climbing Mont Blanc, you'll freeze just like we did! There are a couple of options for ‘free' campsites for motorhomes in Europe, and a lot of it will depend on your motorhome or campervan. There are ‘wild' camping spots for motorhomes, but do your research well. For example, ‘wild' camping is illegal in Italy (although I'm told it does happen). If you have a van, you'll find it easier to park for free than if you have a big motorhome like us. Use Aires (or the local equivalent). Europeans like Motorhomes. Heck, Europeans LOVE motorhomes. They make room for them, they encourage them and…wait for it… they often provide dedicated parking areas for them that ARE NEAR PLACES you actually WANT to visit. I'm serious. No more being stuck miles away from the nearest town and made to feel utterly unwanted wherever you go (I love the UK, but seriously, we can do SOOOOO much better in this regard) Europe WANTS you to bring your motorhome there. Europe ENCOURAGES motorhome parking and motorhome travel and motorhome EVERYTHING. And it doesn't cost more than a few pounds a night at most. We prefer to use sites like this, as they often have services like fresh water and waste disposal. They are first-come, first-served, but we've hardly ever had a problem finding a space for the night- even in the middle of August at the Italian lakes. I hope you're feeling much happier with yourself and your upcoming adventure! Is your vehicle road legal? Do you have insurance, MOT and your driving licence(s)? Remember to take all this paperwork with you, along with your passports. Do you have the safety equipment required by each country you will be DRIVING THROUGH, not just the final one you are visiting? You can check this easily online by googling. (For example, we potentially need snow chains in Germany, depending on our route) We also need a vignette if we're going to Switzerland. Do you have a freshwater hose? Most places expect you to provide your own. If you have a drone, check the rules and requirements for each country you might fly in. Ideally, print them out so you can remember. Pack some easy food to prepare for the first night. I'm a big believer in eating local food. It's one of my favourite parts about travelling BUT when you've been driving all day and all you've seen are service stations, something easy, hearty and familiar is a great comfort as you settle in to your epic adventure. Our meal of choice is chilli, providing we can keep the mince cold. Otherwise, we choose soup and bread, sandwiches or tinned food. You might not win any culinary or health awards, but your sanity might just be saved!! Whilst we're on the subject of food, be prepared for kids who don't share your excitement for the local cuisine. Most kids, including ours, like something familiar. Jade is a particularly fussy eater and, unfortunately, she would rather not eat than eat something she doesn't really like. So, in order to make life easier and less stressful, I try to make sure there is food on board I know that she will eat. Little things like this make a Motorhome road trip far more fun for all the family! Neuschwanstein Castle- parking with a view! And that's it. Not difficult but the first (second, third, seventh and eleventh) motorhome road trip to Europe can take a lot of planning. But above all, it's supposed to be fun. You're supposed to look forward to it. If you find yourself dreading it, figure out ways to make things easier for yourself or change the plan entirely. It's normal to be nervous- I always am as we set out, wondering where we'll end up and what I've forgotten (check out our motorhome packing list HERE). But everything works out along the way. The world is waiting for you to go explore it. I wish you many safe and exciting European motorhome travel adventures! Did you plan a Motorhome Road Trip to Europe? Where are you going? Let me know below (right at the bottom of the page). Know someone who might benefit from a bit of Motorhome Road trip advice? Feel free to share this post with them on social media.